Purchase a box of 10 coin holders produced by Leuchtturm to help protect bullion coins like 1/4 oz Gold Maple Leaf Coins. Acrylic coin capsules can store, safeguard, and help you proudly display your coins. Measuring 20 mm by its inner dimensions, these hard plastic, transparent coin holders will not damage your coins. They are inert, acid free, softener free, and safe for long term storage. Use these acrylic coin holders to store and protect 20 mm diameter coins like 1/4 oz Gold Maple Leaf Coins. Why buy 20 mm Coin Capsules from Kitco? Kitco is a trusted leader in the physical precious metals and bullion industry. 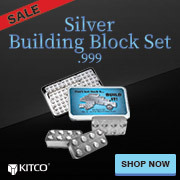 Gold, silver, and other precious metals sold by Kitco are recognized in bullion markets around the world. With our focus on gold and silver bullion, you can benefit from our low prices and premiums that are highly competitive in the industry. At Kitco, we make it easy for you to manage your tangible wealth. You can buy and sell gold coins, silver coins, and other physical precious metal items using our convenient online store, or by contacting our team of highly trained precious metals specialists. Backed by our global information network, Kitco is proudly serving our customers since 1977. Bullion Coins and Coin Capsules are sold separately at Kitco.